The Parade is hosting a food drive to benefit Second Harvest Food Bank of the Lehigh Valley. The Parade is partnering with several local businesses and the Minsi Trails Council to help collect food the day of the parade. Cub Scouts will be walking in the Parade collecting donations from spectators. The Food Drive will kick off at the annual Parade fundraiser being held Sunday February 17, 2019 at Christopher's Restaurant at the Knights of Columbus. Donations will also be taken at the Coronation Celebration and the Irish Cultural Community Day. The Parade is asking all spectators of the Parade to bring a nonperishable food item to donate. Second Harvest Food Bank of the Lehigh Valley and Northeast Pennsylvania is helping thousands of people who are struggling to put food on the table throughout our six-county service area. 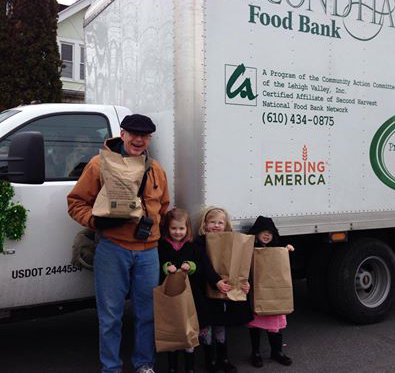 Last year, Second Harvest distributed nearly 7 million pounds of food to our network of over 200 member agencies. Now, our member agencies are serving more than 69,000 people each month. Around the turn of the century the sixth ward in Allentown was the heart of the Irish community. There was a Young Men's Temperance Society and the Hibernia Fire Company Social Club where many Irishmen belonged for social activities, a number of which took place on or around St. Patrick's Day. In 1955 a committee of business and political leaders formed a St. Patrick's Day Observance Society. 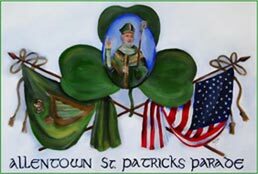 By 1958, the parade was large enough to run from 12th & Hamilton to the Immaculate Conception Church on Ridge Ave.
Saint Patrick was a 5th-century Romano-British Christian missionary and bishop in Ireland. Known as the "Apostle of Ireland", he is the primary patron saint of Ireland along with Saints Brigid and Columba. 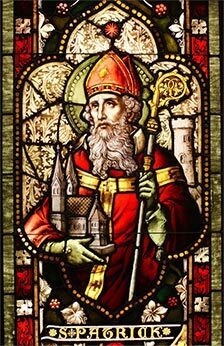 The dates of Patrick's life cannot be fixed with certainty but, on a widespread interpretation, he was active as a missionary in Ireland during the second half of the fifth century. He is generally credited with being the first bishop of Armagh, Primate of Ireland.